I've been posting up progress on my project in Maya and explained breifly my idea, but I haven't gone into much detail about what I want my image to achieve. As the brief is to create an image that tells a story but has ambiguity I'm taking the path of creating a 'disaster' scene of a place that used to be alive but is now dead, as a few other students are. We were told Gregory Crewdson was the genre-defining artist to look at for this project, so I wanted to create an image that had similar themes and aspects to his series 'Beneath the Roses'. Crewdson's art is very American, focusing on the surburban and rural towns and laying a strange blanket over them, making them seem detatched and alien. This is where my idea stemmed from, I wanted to create something with a similar feel set in London, a city closer to home. 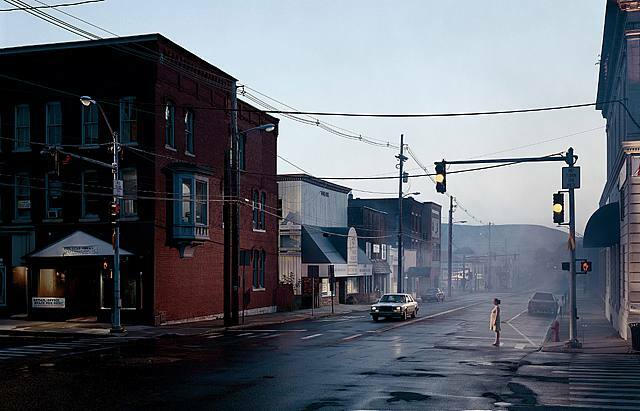 Something I really like about Crewdson's images are the use of Mist in the mid-distance, it isolates the scene from the outside as well as giving it a very strange feel. I want to use a fog-like substance in my scene, implying the fallout of a catastrophe or perhaps just weather and nature taking over the abadoned city. The focal point of my image is still to be decided. It will be something showing abandonment, as if everybody left in a hurry. The 'story' element of the scene will be portrayed in leaflets scattered over the ground, they will not be readable but will suggest some sort of mass exodus. These are the ideas bouncing around in my head, I know the feel and the effect I want the image to have, I'm just trying to turn that into actual objects and design the scene. At the same time, I don't want to repeat the mistake that Phil pointed out in my first project, of including too many references implying a similar thing, so it may be that I will decide to simplify it, and just have one main focal point.